The Book of Job tackles the age-old question of why God allows bad things to happen to good people. The character Job and four friends debate it for 31 chapters. Then God speaks. Writing to a church and a city troubled by rivalries and quick judgments, Saint Paul calls them to much higher standards for very new reasons. Having left the crowds, Jesus is with only the disciples he holds closest. But they still have too little confidence in him, and fail to understand him. Our Literary Setting: This is a book of the Wisdom tradition, of uncertain provenance. Among its purposes is to vanquish one of the naive assumptions of all religions, that God always rewards the good. Here's the setup: There was "a blameless and upright man named Job, who feared God and avoided evil." But Satan makes a bet with the Lord, that Job can be made to curse God if Satan is permitted to take away the things that make Job happy. Seriously, that's how the book starts. You know much of the rest, how Job gradually loses all that is dear to him. A trio of friends visit and propose that Job must be guilty of a sin, not publicly known, that has caused him to lose favor with God. Job denies this, and a long, nuanced discussion follows. Each friend speaks three times, and Job responds to each speech. In every speech, a friend tries to convict Job, and then Job vindicates himself. After thirty-one chapters, the prosecutorial friends are silenced, and Job has honestly questioned the fairness of God. This prompts a fourth visitor, named Elihu, to enter the conversation. He is dismayed that the three others had not defeated Job in the argument, and angry that Job considered himself, not God, to be in the right. Elihu gives a great speech in defense of God's righteousness. He describes God's power manifest in nature, especially in storms. The Theological Development: Thus the whole book is a powerful statement that God's ways are not ours, that God does not simply reward all good behavior and punish all sin, that the mind of God is often unknown to us, and that human suffering is not all punishment due to sin. We could say that the book prepares the world for Isaiah, chapters 40-55, where the Suffering Servant poems make explicit the hope that good for others can come out the sufferings of an innocent person. That, in turn, prepares the world for the good news of Jesus. Proclaiming It: Now you have the original context of today's first reading. To use it only to create an echo of the day's gospel reading seems to trivialize it. 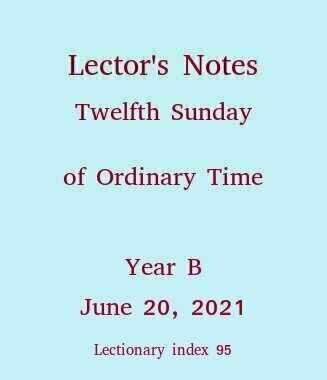 The lector should be faithful to the text, even if that puts the lector on higher ground than the editors of the lectionary. In this proclamation, yours is the voice of the Lord, the Lord demonstrating transcendence over all human argumentation. You are the Lord, sarcastically asking your questioners, "Where were you when I founded the earth?" You are the Lord barking orders to the sea itself (to the ancients, the most mysterious and terrifying natural element), "Thus far shall you come but no farther, and here shall your proud waves be stilled!" The Historical Background: What we know about Paul's relationship to the community in Corinth suggests we interpret this passage narrowly and personally. That is, it may be just about that relationship. On the other hand, Paul is the master of seeing the personal in terms of the divine, of addressing the particular from a cosmic point of view. Let's see how he does that here. Corinth was not an easy place to start a church. It was Greek and a seaport, a cosmopolitan place where multiple Greek philosophies and religions were current, and where seaport morals were common. Yet some had received the gospel enthusiastically from Paul, as the better known First Letter to the Corinthians shows. In this lively community some members were prone to be competitive and to judge each other harshly. Indeed some judged Paul himself harshly, particularly when he canceled a planned trip to Corinth in order to attend to matters he judged more pressing. their regard for others, in that they no longer think of each other as competitors, but as co-members of a new creation. Proclaiming It: All that only takes you a short way toward making a clear proclamation. These are complicated sentences, with clauses dangling from clauses, and pronouns with uncertain antecedents. If you remember from your school days how to diagram sentences, you might try it on these. In any case, speak slowly, pause where the commas are (or should be), change your tone of voice clause by clause. 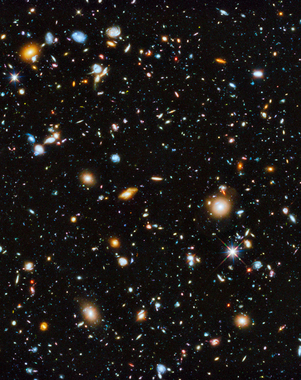 This image by the Hubble Space Telescope is the most comprehensive view yet of the universe's evolution as seen by a space telescope. The coloful image, released June 3, 2014, contains 10,000 galaxies, with the different colors denoting different wavelengths.